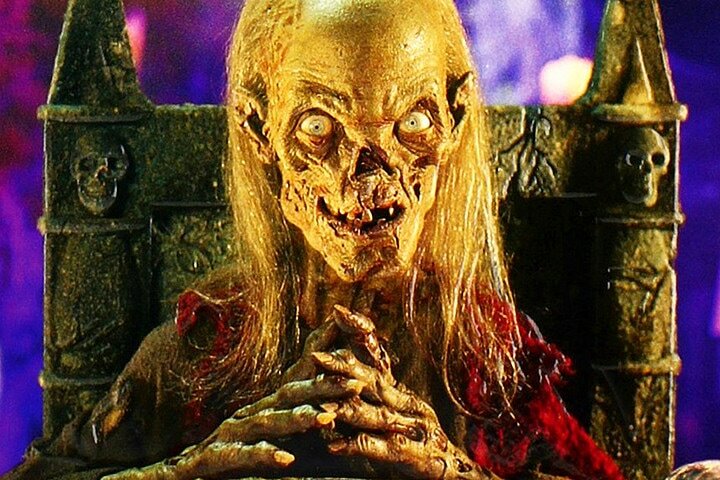 The Crypt Keeper is probably most famous for his hosting duties on the horror anthology show, Tales From The Crypt. The show which aired on HBO (and later in watered down versions on the FOX network), ran from 1989-1996. The show was backed by some high profile talent like Robert Zemeckis (Back To The Future Trilogy), and Richard Donner (Superman: The Movie). The program also had some killer guests stars throughout its run which included the likes of Brad Pitt, Tom Hanks and, Christopher Reeve. The Crypt Keeper's voice is provided by John Kassir. The character would book-end each episode of the show, spouting off some wise-cracking commentary which usually included puns having some gory, or horror themes behind it. The HBO show was not the first incarnation of the character. The Crypt Keeper got his start in the horror-pulp comic Tales From The Crypt from the 1950's, and looked very different than the skull and bones host we know today. The HBO show would pay homage to its origins, by having each episode begin with a mock-up cover of the Tales From The Crypt comic. The show also wasn't the first adaptation of the comic. A movie version of Tales From The Crypt, was released in 1972 and starred Joan Collins and Peter Cushing, among others. The 1989 Tales From The Crypt, spawned two feature films: Tales From The Crypt Presents: Demon Knight (1995), and Tales From The Crypt Presents Bordello Of Blood (1996). The Crypt Keeper himself would also branch out to other shows as well. Tales From The Crypt Keeper debuted in 1993, and was an animated series aimed more towards kids. The series ran for 4 years. He would also host his own game show in 1997 called Secrets Of The Crypt Keeper's Haunted House which aired on CBS, and won a Daytime Emmy Award for lighting. The show also had ties to Universal Studios Florida, as it was shot there. In 1995, Universal licensed the character to come and be the face of Halloween Horror Nights 5. The event was subtitled Curse Of The Crypt Keeper.